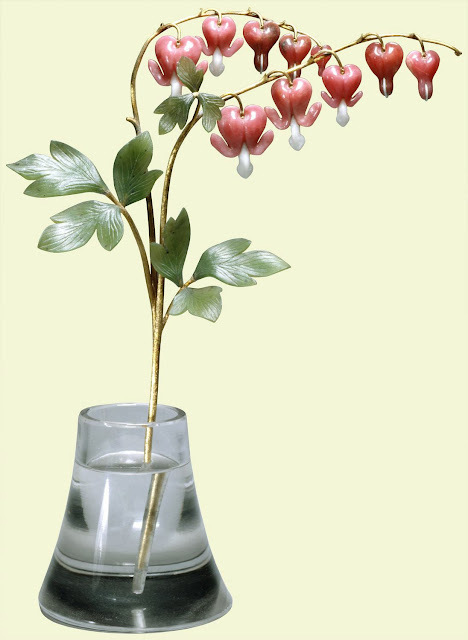 The flowers called Bleeding Hearts in English we in Sweden call Löjtnantshärtan, which means Lieutenant Hearts. They're really pretty, and here is a sprig made by Fabergé! The gold-stalked double spray sits in a vase of rock crystal. The flowers are carved in rhodonite and quartzite, with three sets of three carved nephrite leaves. To make the flowers as true to life as possible they are set en tremblant, which means they can move gently, as blown by the wind. The dimensions of the whole object are 7.5'' x 6'' x 2.4'' (19 x 15.3 x 6.2 cm), and it was acquired by Queen Mary in 1934. Now it is part of the Royal Collection.